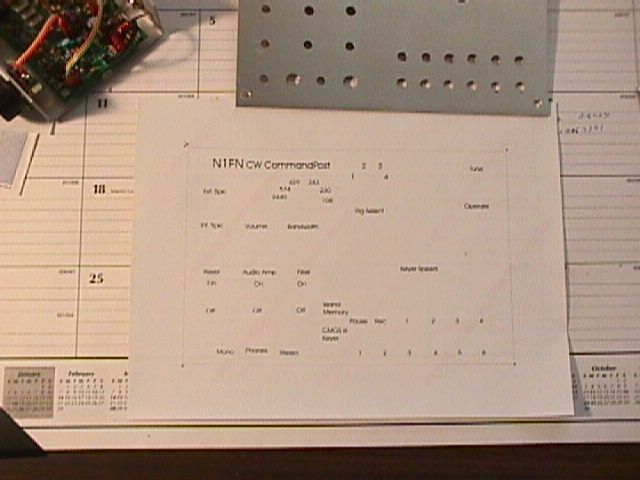 A computer program is used to generate a plain-paper drilling template to mark and punch the locations of holes for controls, and then (using the same artwork) to create a printed self-adhesive label for the panel. I used Corel Draw, but you can use any graphics or drawing program that will print drawings in actual sizes. 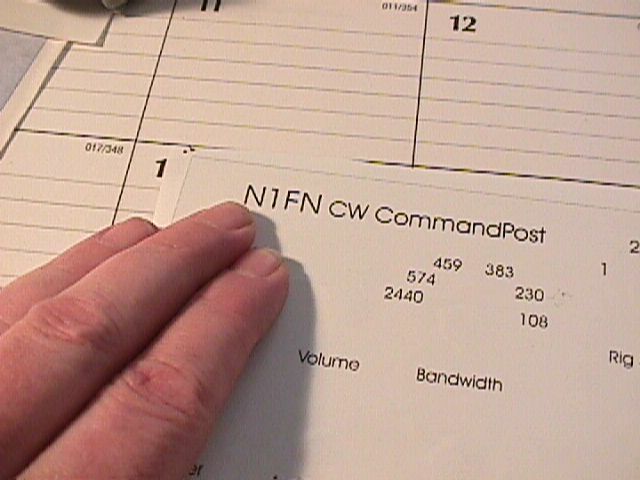 For example, I can draw a 1" squarewith the program and have it print exactly 1" square. You will also need a graphics printer. In version one of this label I used an ink jet printer, but ink jet inks are fugitive, that is, they will smear if exposed to moisture. 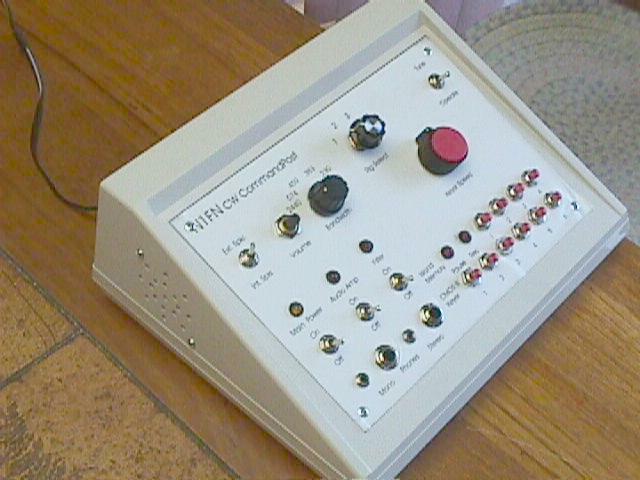 In the second version. detailed here I used a laser printer. If you don't have an appropriate computer, program, or printer, it may be possible for you to use one at Kinko's or your local public library. 1. 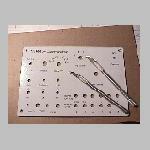 Create the drilling template and drill the panel. In the drawing program, draw a rectangle to the exact dimensions of the panel you are using. Print the rectangle on plainpaper to verify that it is the right size. 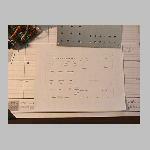 You could set your paper size to the dimensions of the panel, but the materials are 8-1/2 x 11 and without the rectangular outline it will be difficult to line things up. 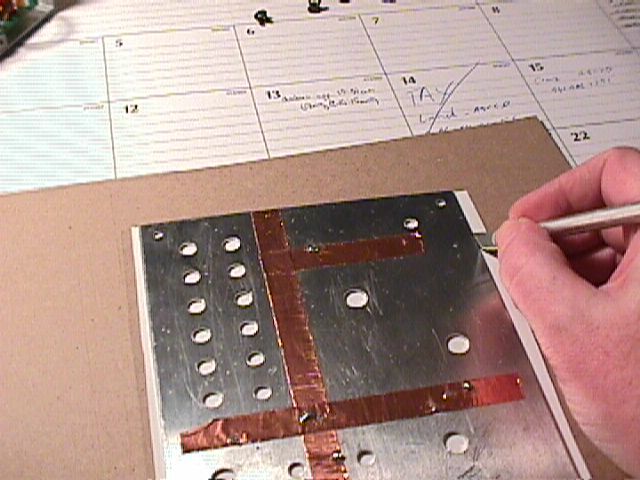 In the drawing program, mark the locations of holes with the letter "x." 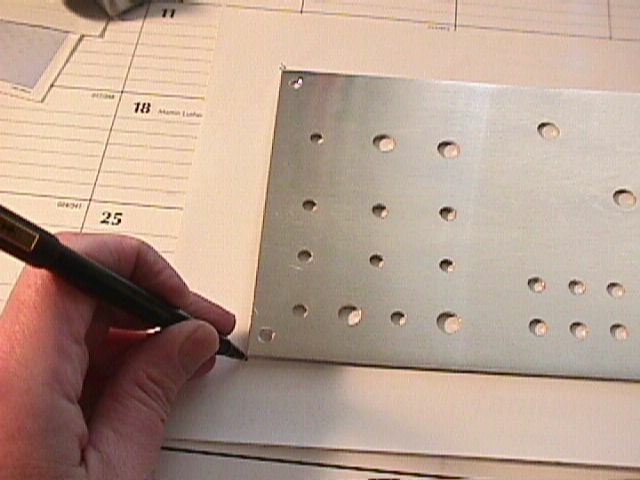 Use the program's rulers and guidelines to locate the holes precisely. Save the drawing for future reference. Print the drawing on plain paper. 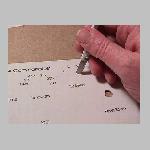 With a pen or pencil, indicate next to each "x" the size of the hole to be drilled. 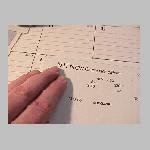 Use a pen, or pin, etc, to mark the corners of the panel drawing. Place the paper face down on the table, and apply a thin coating of rubber cement to the paper. 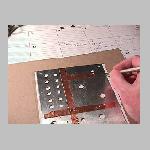 Lay the panel on top of the panel, lining up the four corners with the pin marks that you made. 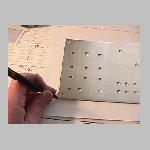 Turn the panel with attached paper over and use a center punch or nail to punch the center of each "x" or hole location. 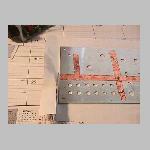 This is necessary to both the mark the drilling location and to start the hole and keep the drill bit from wandering. Start with a drill for the smallest hole required (or 1/8" if no smaller holes are needed). Drill ALL of the holes to that size, even the larger ones. Select a drill for the next largest size that is needed, and drill out all of the holes for that you marked as being that size or larger. Repeat this process until all of the holes are done. De-burr the holes on the reverse side of the panel with a "rosette" countersink bit, or a round file, or a sharp knife (if you're working in aluminum). Remove the paper drilling template (that's why we used rubber cement and not glue). Go back into the drawing program and letter each control and add any desired artwork, using the "x's" to reference the locations of the controls. Be sure to allow for the size of any knobs or switch fittings-- you don't want them to cover the lettering. Your drawing program might allow you draw circles around the "x's" to aid in this process. If you added circles around the hole locations, delete them. You can also delete the "x's" from the drawing if you want to, or if they are larger than the holes that they mark. Print the label on self-adhesive label material. Save the drawing with a new name, for future reference. 3. Apply the label to the panel. Lay the panel face up on the table and place the label on top of it. Move the label as needed so that the panel outline (the rectangle you drew in step 1) matches the panel underneath. Use a pen or pencil to mark "dots" at the four corners, pressing firmlyinto the label material but being careful not to tear it. 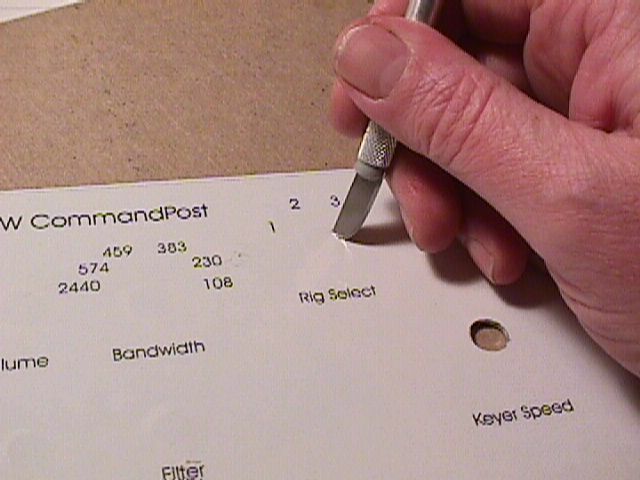 Turn the label over and mark the back side of the four corner dots by pressing with a pen again. This is to be sure you will be able to see the corner marks once you remove the backing from the label. Remove the backing from the label and lay it on the table, adhesive side up. Carefully position the panel on the label and press down firmly. 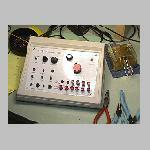 It is easiest to start at one of the larger sides and "lever" the panel down onto the lable. At this point, if the label is much larger than the panel, you can do a rough trim with scissors. 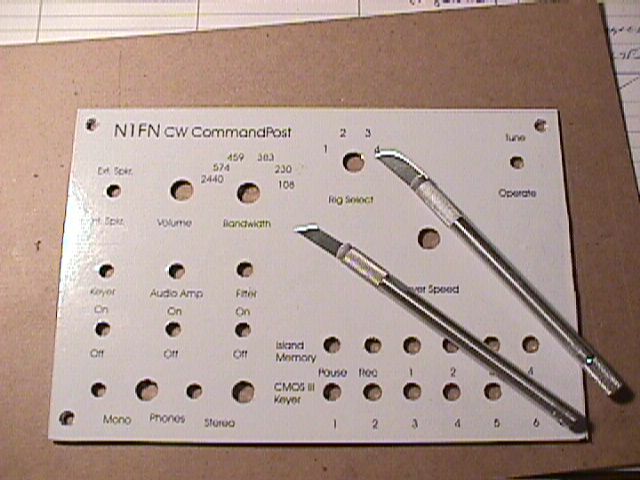 In the illustration, the copper strips on the back of the panel are foil tape used for ground connections in the CW Command Post. Turn the panel over and rub the label all over to remove any air bubbles and insure firm adhesion at the edges of the holes and the edges of the panel. Apply the clear plastic overlay (laminating plastic) and press it firmly to the label. Again, you can rough trim with scissors if necessary. 4. Trim the label and clear the holes. Turn the panel over (with label and plastic cover attached) so that it is facedown on the table. Using the edges of the panel as a guide, use a sharp hobby knife to trim the label and plastic flush with the edge of the panel. Create the holes in the label and plastic by carefully trimming out the center with a sharp hobby knife. A knife with a curved or rounded blade works well for this. I use a vertical sawing motion (like a sewing machine) to work my way around the hole. Take your time, and be sure that the cuts are clean because ragged bits of paper or plastic will catch when you mount the controls later and mess up the whole job! If you have any countersunk holes (e.g. the four screw holes at the corners for mounting the panel to the box) you will find that a straight blade works better, as it follows the taper of the hole better. 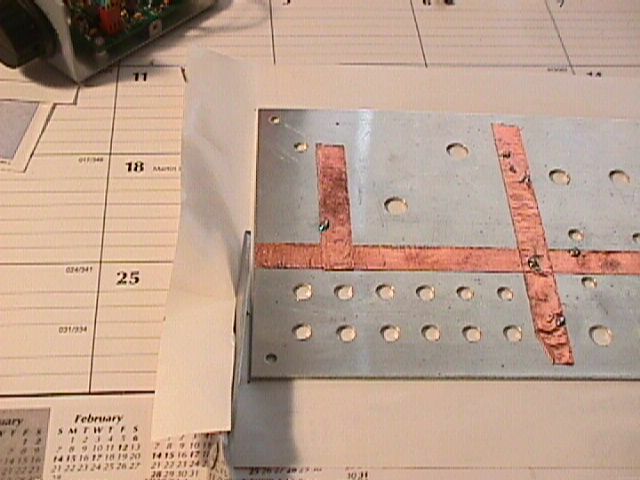 Here's what the panel looks like when you are done-- note the shapes of the blades used for straight holes and countersunk holes, as described above. Et Voila! 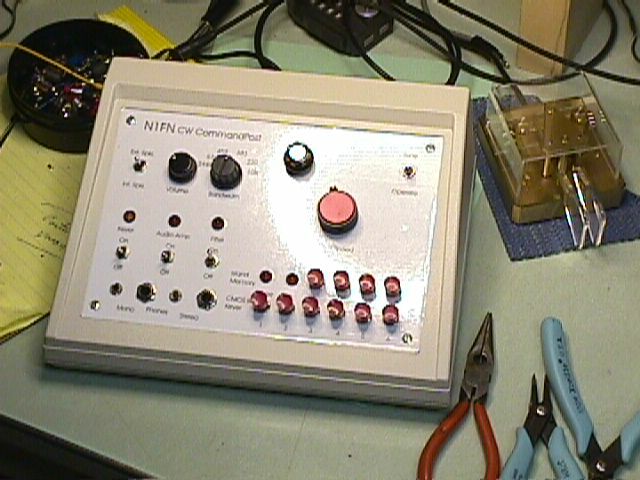 Here's the completed unit with the panel in place. Sorry about the glare from the lamp-- I'll replace the picture when I get a chance. I have re-formatted these web pages and taken the opportunity to make minor corrections and clarifications. The new labels were relatively easy to do since they were based on the original drawing files.